Craik, Saskatchewan will be the site of an Industrial Hemp Production Meeting on Friday March 10th, 2006. The meeting is being produced by the nonprofit Canadian Hemp Trade Alliance (CHTA) and Saskatchewan Hemp Association (SHA). "Because of strong prices and growing hempseed markets, we are happy to be back in Craik for our 2006 Production Meeting," says Arthur Hanks, Executive Director, CHTA and Manager of the SHA. "Continued demand for hemp shows that this crop will have a good future in Saskatchewan." "We have a growing industry with hemp, and its important we do it right. Our meeting will give producers the information that they need to have a successful crop and harvest," says Hanks. "We will be talking about agronomics -- both organically and conventionally -- the hemp value chain and where the market is going. We"ll also look at breeding efforts, contracts, new product development, research and marketing." Speakers will include, Kevin Friesen, Hemp Oil Canada (Agronomics), Duane Phillippi, Farmer Direct Co-operative (Markets and Adding Farmer Value), Anndrea Hermann, Hemp Oil Canada (Breeding), Martine Carlina, Hemp Management Group (Nutrition and Markets), and Arthur Hanks, CHTA/SHA (National Report). Full program TBA. The meeting will be held at the innovative Craik EcoCentre and will run from 10:30 AM -3 PM with a break for lunch, served at the onsite Solar Garden Grill. Craik, SK is on the Louis Riel Trail (Hwy. #11), close driving distance from both Regina and Saskatoon. Admission fee will be $10 and includes lunch and day long coffee. This event is sponsored by Saskatchewan Agriculture and Food. Established in 2004, the CHTA is a national group of hemp processors, marketers, farmers and researchers. The SHA is a Regina-based service organisation that works with producers on areas such as hemp licensing, cultivation, marketing and networking. BISMARCK - North Dakota and three other states made their case Friday, with the U.S. Drug Enforcement Agency (DEA) to allow the cultivation of industrial hemp. "The DEA people were very cordial, but they told us that the process of legalizing the production of industrial hemp will be extremely complicated under existing federal law," said Agriculture Commissioner Roger Johnson. "DEA has never responded to our earlier inquiries, but today, we were able to present our case and learn from them what may be required in terms of regulations and safeguards." Johnson and the agriculture commissioners from Massachusetts, West Virginia and Wisconsin met with DEA officials, including Joseph Rannazzisi, deputy assistant administrator; Robert C. Gleason, deputy chief counsel, and Eric Akres, chief of congressional affairs. Johnson said the North Dakota Department of Agriculture is in the process of drafting new rules to control the production of industrial hemp, and that he wanted to solicit input from DEA. The new rules would implement state laws, passed by the Legislature in 1999 through 2005. "We were told by DEA that growers, processors and importers of hemp seed would each have to be separately licensed, and that DEA would need to establish quotas for the production and processing of industrial hemp," he said. 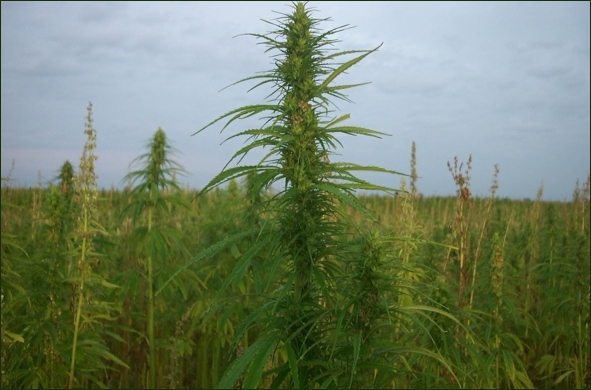 Johnson noted that the United States is alone among industrialized countries in banning cultivation of industrial hemp. "The Canadians lifted their ban in 1998 and are now moving forward with large-scale cultivation of industrial hemp," he said. "It is obviously a crop that could do very well in North Dakota and provide our producers with another income source, as well as a valuable rotational crop." Industrial hemp (Cannabis sativa) is widely grown around the world and is used in the manufacture of textiles, papers and rope. Its seed is also used for food and feed. Oil derived from the plant is used in cosmetics, paints and medicinal compounds. The industrial form of hemp contains only trace amounts of the psychoactive drug delta-9 tetrahydrocannabinol (THC) found in marijuana, although DEA does not currently recognize industrial hemp apart from marijuana. Driven by increasing environmental awareness, automakers in the 1990s made significant advancements in the development of natural fiber composites, with end-use primarily in automotive interiors. A number of vehicle models, first in Europe and then in North America, featured natural fiber-reinforced thermosets and thermoplastics in door panels, package trays, seat backs and trunk liners. 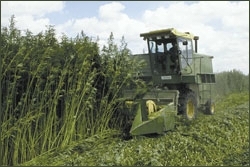 Harvesting of mature hemp plants, using a custom-designed swather. Promoted as low-cost and low-weight alternatives to fiberglass, these agricultural products, including flax, jute, hemp and kenaf, signaled the start of a "green" industry with enormous potential. A market study in 2000 projected growth rates exceeding 50 percent per annum through 2005. Actual growth, according to natural fiber suppliers, has been much lower, although still respectable at 10 to 15 percent per year. Factors that have retarded growth include limitations in processing technologies and molded part performance as well as the recent economic lull that depressed auto sales and prompted a renewed focus by OEMs on purchased part price, which temporarily overshadowed potential weight savings, and concerns for recyclability and environmental stewardship.